In the fall Crex Meadows becomes a staging grounds for hundreds of sandhill cranes gathering to fly south for the winter. During the day they visit the farm fields, some of which are a part of Crex and others are in the surrounding area. They eat left over grains and insects building up their energy reserves for the long upcoming flight south. At night they stand in the shallow lakes and pools of Crex. The waters act as protection and alarm against ground based predators that might try and sneak up on the birds in the dark. 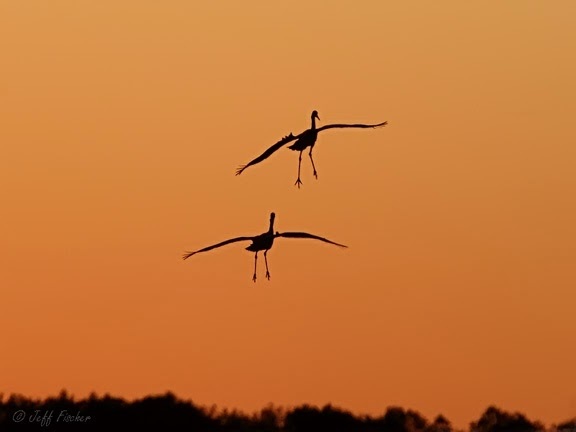 The treat for us humans is in the morning and night when the cranes are flying out or returning. In this shot the sun had just sunk below the horizon. Birds were still coming in providing me with wonderful silhouette shots against the blaze orange sky. What a brilliant sky for the cranes to fly into... a gorgeous photo! A perfect SWF post, well done! Fabulous capture of the birds in flight against the colourful sky. Such a great capure !! Love this SkyWatch Friday shot. Bravo!